Mother’s Day is a day to stop for a minute and honor the woman who gave you life! Moms are modern day superheroes and deserve to be acknowledged for all they do day in and day out to keep your life running smoothly! 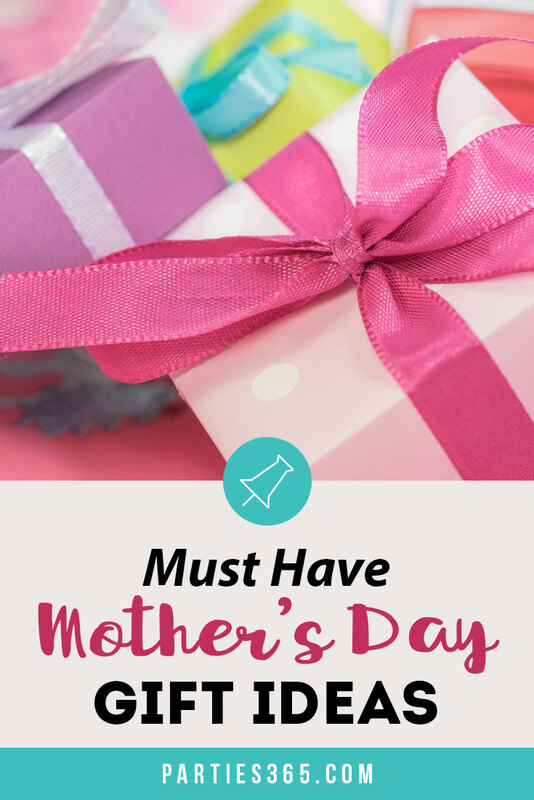 Whether you’re looking for ideas for your own mother, a mother-in-law, a mother-to-be, a grandmother, a dog mom or a woman who acts like a mother in your life, we have some fabulous gift ideas for you! 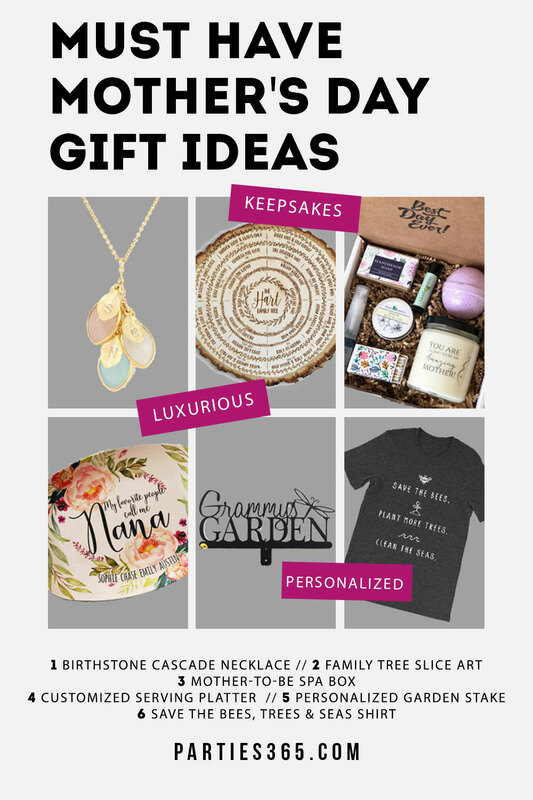 Our Mother’s Day Gift Guide will help you knock out your shopping in no time! I don’t know about you, but sometimes I feel like my Mom is the hardest person to shop for! She’s always giving and never wanting, so there aren’t many clues to what she’d really like as a present. That’s why we filled our Mother’s Day Gift Guide with things that are beautiful, interesting and will have personal meaning. We have other gift guides too for women who love wine and for women who love to entertain, so check those out next if you need even more ideas! But without further ado, here are the Mother’s Day Gifts we’re loving this year! Are you shopping for a first time mom who’s pregnant on her first Mother’s Day? 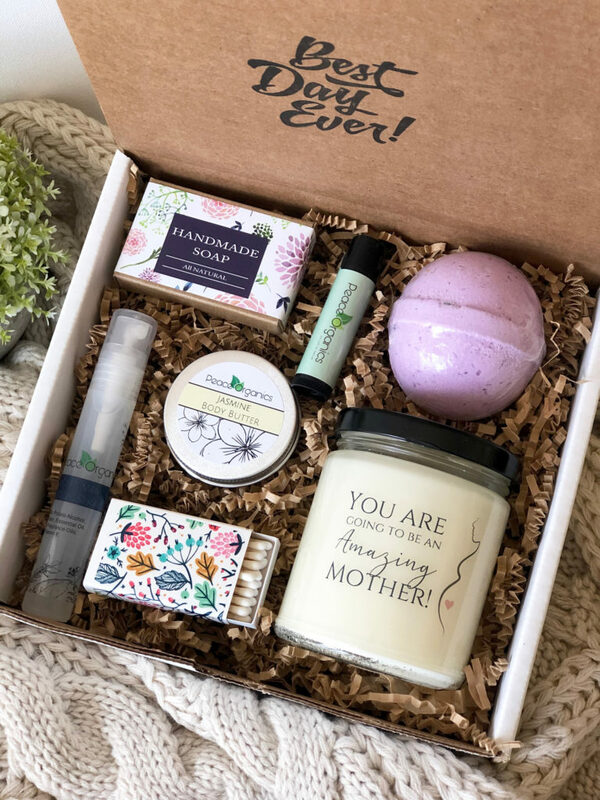 If so, she totally deserves a day of pampering and relaxation and this spa box has everything she needs to experience a relaxing day while waiting for that new bundle of joy to arrive. The spa box is full of all natural, plant based luxurious bath products, soy candle and includes a gift card you can personalize. 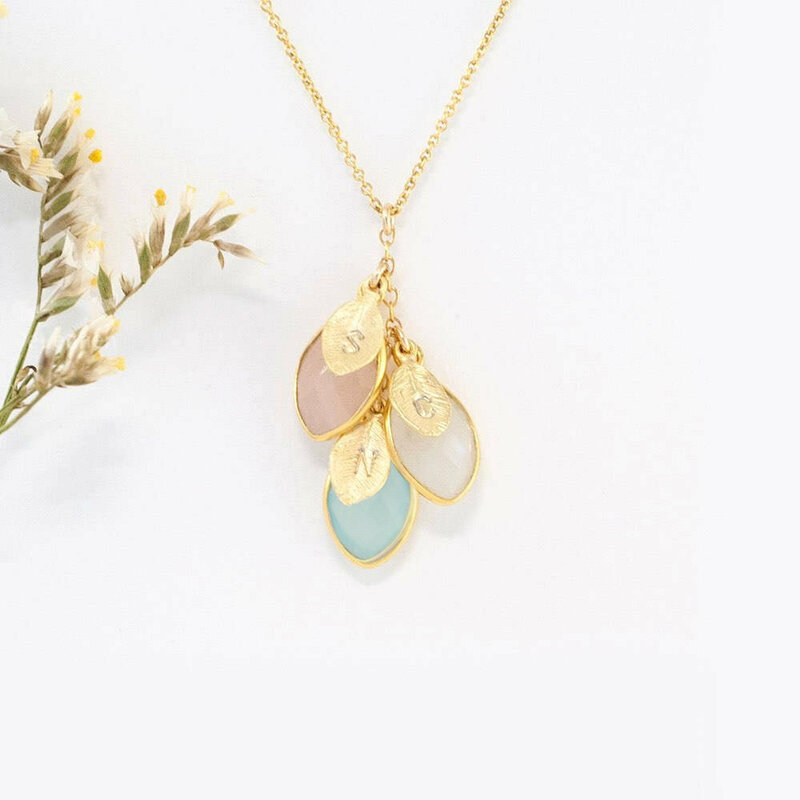 Jewelry is always a wonderful choice for a gift and we fell in love with this amazing, one of a kind, personalized hand stamped birthstone cascade necklace. You can choose the birthstones of each of her children, the initial that’s stamped on the stone, the metal and the length for your necklace. This is something she’ll treasure for years to come! 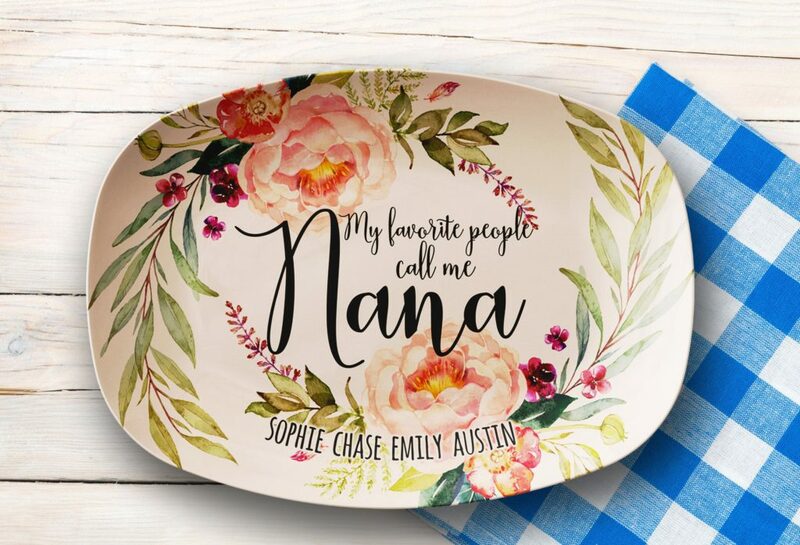 Treat the mother or grandmother who loves to cook and entertain with a unique one-of-a-kind personalized platter. This 10″ x 14″ serving platter is microwave and dishwasher safe, BPA-free and make a lovely gift that can be used over and over for years to come. What better way to display your family tree… than on a tree! 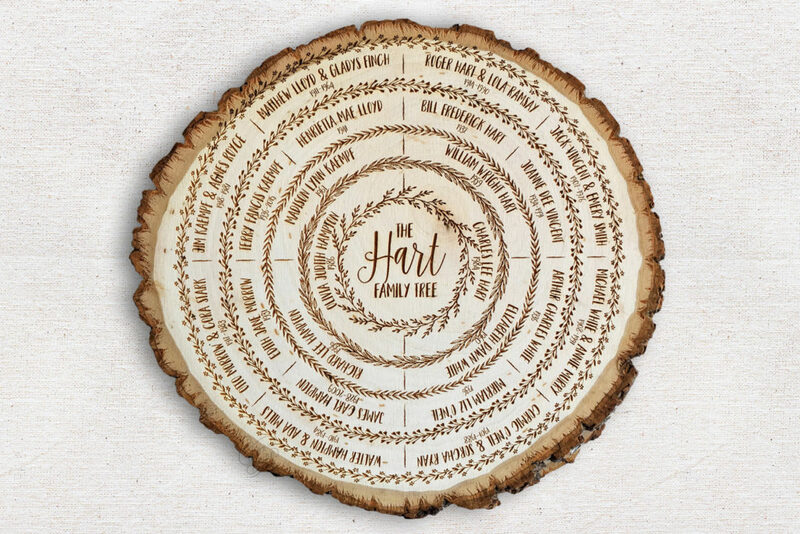 Each genealogy chart is hand illustrated with love and engraved (burned) into a wood slice harvested from a sustainable forest. This personalized piece of art will become a family heirloom and a conversation starter for any home. 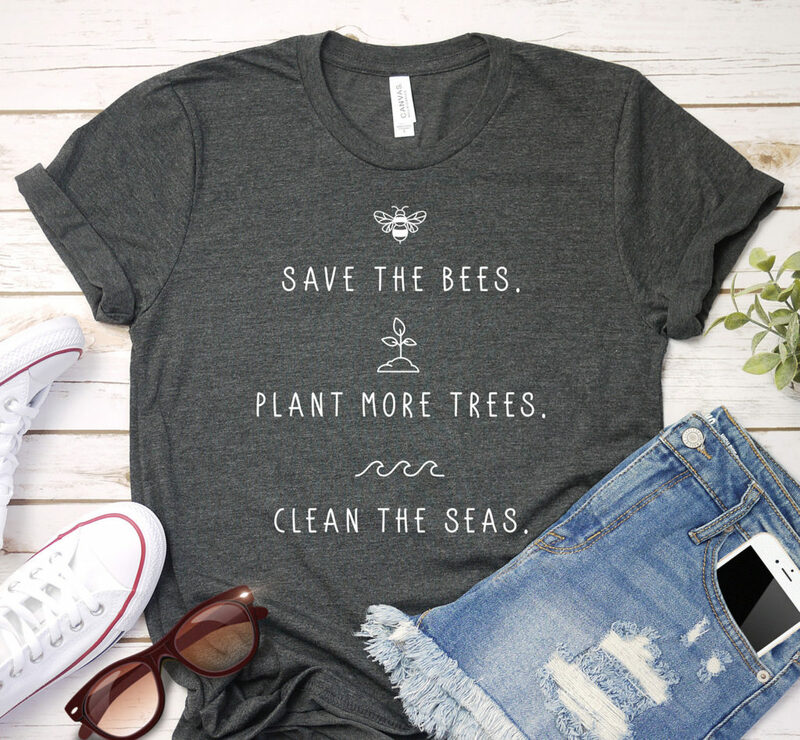 Available in a tee, tank or hoodie, your eco-minded, zero waste focused, earth loving mama with adore this Save The Bees, Plant More Trees, Clean The Seas T-Shirt! She already wears her heart on her sleeve as your mom and this shirt will help her display her values for the world to see! Did you know gardening is a terrific stress reliever? Perhaps that’s why so many moms and grandmother’s love it! 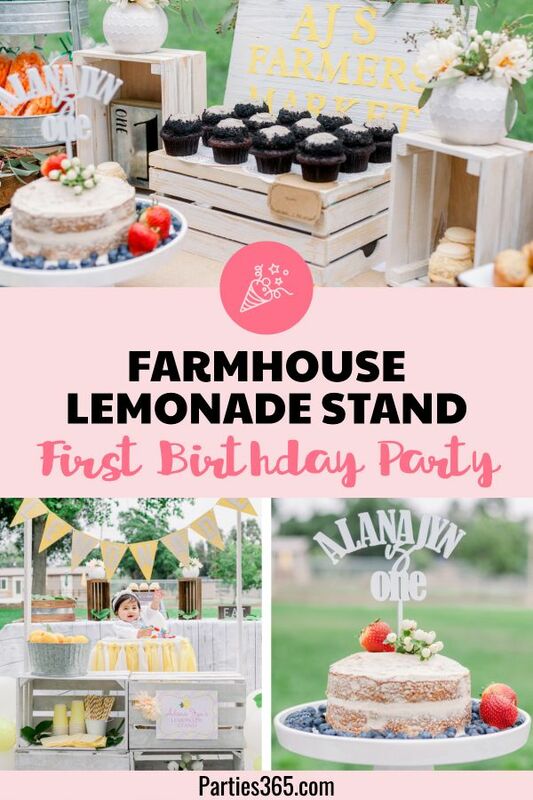 Lol She’ll adore a personalized garden stake to help lay claim her little patch of dirt. 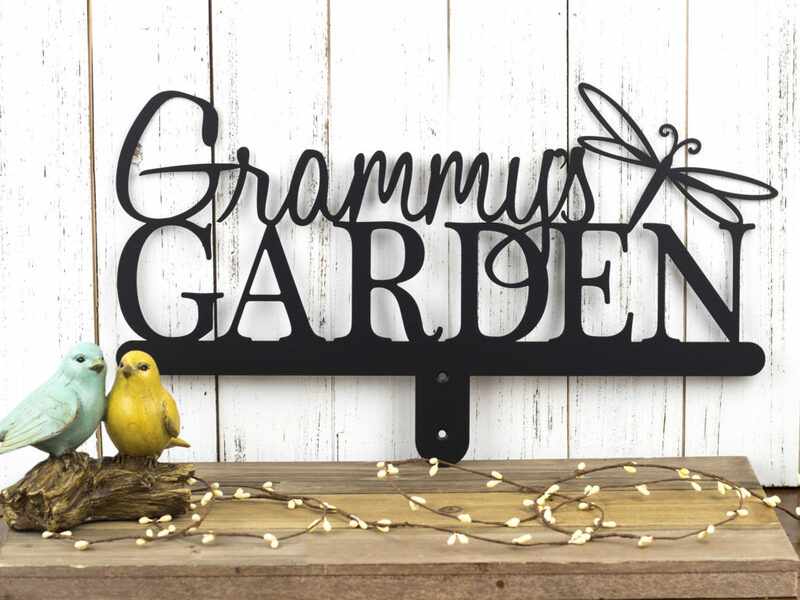 This 18″ x 10″ garden stake is made of 12 gage steel and powder coated to protect it from the weather. You can also choose her favorite insect to adorn her name. OMG. 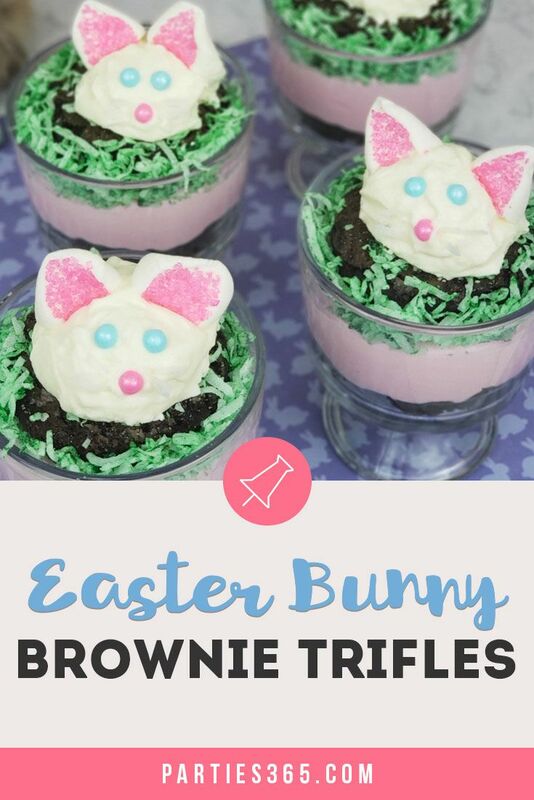 These are totally amazing! If you’re shopping for a dog mom or other pet lover, this is the perfect gift! I promise – no one else will have anything like this unbelievable planter! 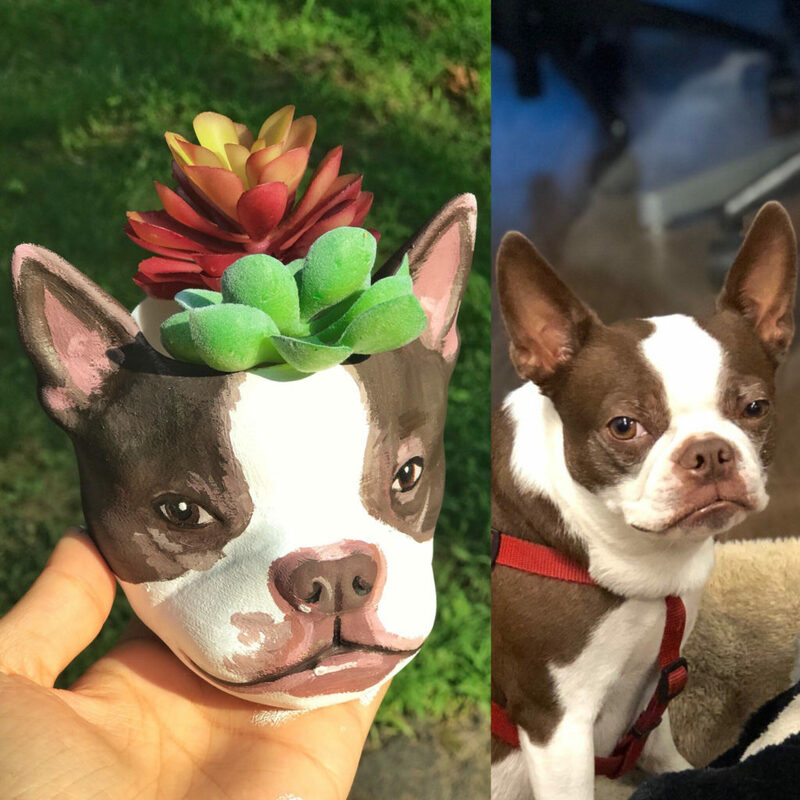 Made from PLA biodegradable plastic, these planters are hand painted to look just like your pet and come in three different sizes. 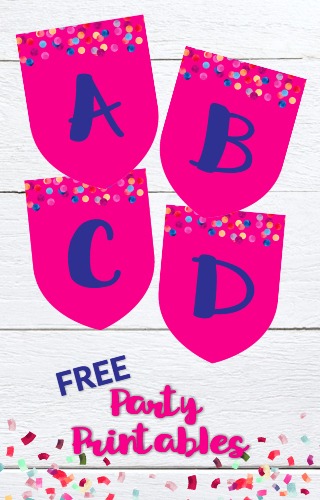 You’ll win the gift game with one of these! Seriously, is there anything a mom wants more than Prime boxes showing up at her door full of goodies she didn’t have to pay for herself? No. No there’s not. 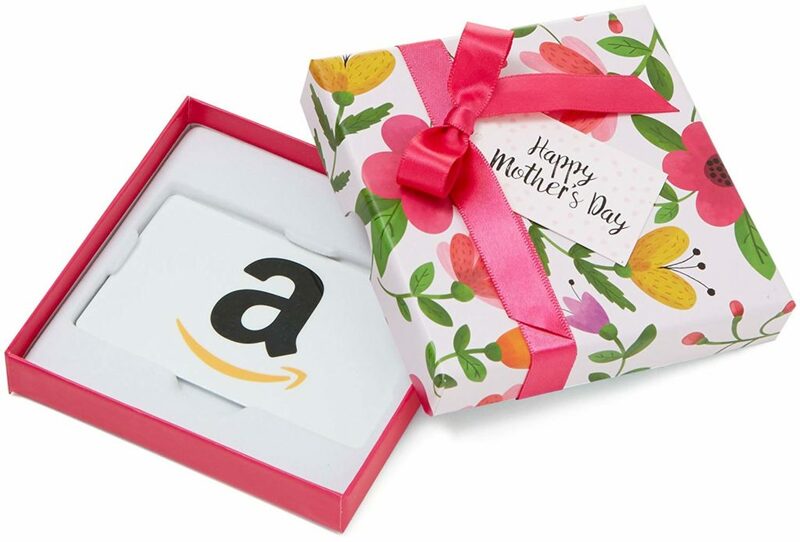 Give her an Amazon gift card – easy for you, but always a guaranteed win! We hope you found the perfect gift idea for Mother’s Day! 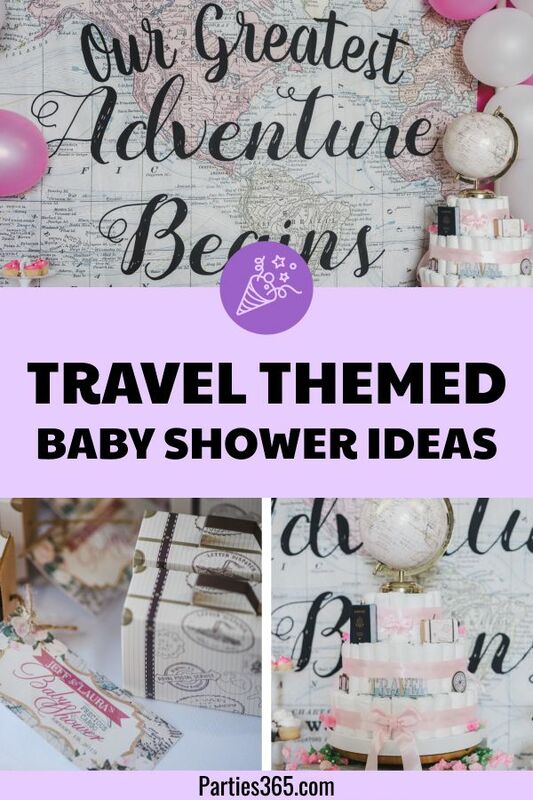 Be sure to Pin this post for later shopping and then check out our other Gift Guides for more ideas!